An herb that is most often considered to be a weed. It has a square stem with green leaves that are serrated along the edges. Both the stem and leaves are covered with very tiny hairs that break off and embed themselves in the skin, causing a burning and/or itching sensation. Stinging nettles, which lose their sting when they wilt or are exposed to hot water, are prepared in the same manner as spinach or other similar greens. 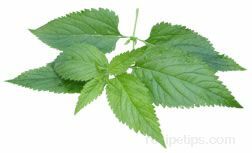 Stinging nettles are most often prepared for use in soups, salads and as a flavoring for foods such as gouda cheese.